Please use the following Size Charts when selecting garments. Measure around neck, allowing room for 2 fingers behind tape. Measure around chest, making sure tape is level at the back. A firm chest measurement should be taken. 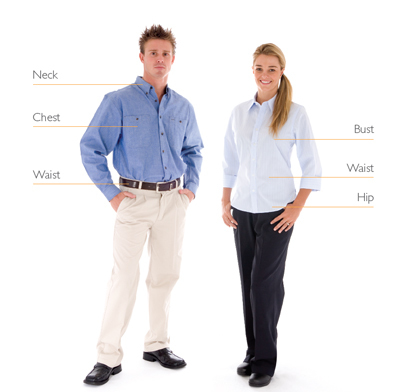 Make sure the trousers are sitting comfortably, and measure over the waistband of the trousers. Measure from the crutch to the top of the heel of the shoe. Measure around fullest part of hips, making sure tape is level.